"The dreugh have two distinct morphologies: The Water Dreugh and the Land Dreugh. Dreugh evolve into Land Dreugh at a period in their lifecycle called Karvinasim, where they grow legs and spend about a year on dry land. 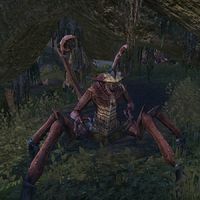 Dreugh are primarily found in the eastern areas of Tamriel, but can likely also be found anywhere coastal. Land Dreugh can be found as far inland as Cyrodiil. Dreugh are large monsters. 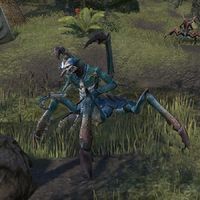 They are found near coasts on eastern Tamriel, but have been found as far inland as Cyrodiil. They use mainly melee combat, utilizing their claws, but they do emit a form of shock spell at times. A basic melee attack that hits multiple times for minor physical damage. A charged melee attack that does moderate physical damage and staggers the player. This attack can be blocked to set the enemy off balance. The enemy charges it pincers and swipes the area in front of it. This attack does moderate shock damage over time to all players as indicated by a red cone. Ruella Many-Claws, a Dreugh found at the Abyssal Geyser. Tamed Dreugh Worker, found at Vivec's Antlers once the quest is complete.